Whenever I see “Changing Places” written down I am mentally adding the word “toilets”. I dislike the name given to the facilities and the campaign because it doesn’t tell us enough. “Changing Places toilets” are not just a place to change pads. That is one need for some users, but not for all. Just because you are disabled, just because you can’t stand or walk, doesn’t mean you can’t manage to use the toilet. You just need the right facilities. My son needs the hoist to enable him to get out of his wheelchair. He then needs the bench in order to sort clothes and switch to using his toileting sling before hoisting to the toilet. Then he can “go” just like most of us can. I also have a number of friends who need to use a powered wheelchair and can self-transfer by aligning their chair with the toilet and using the handrails. Others can manage a couple of steps but they need to get their wheelchair directly in front of the toilet where they can support themselves using the drop down rails which are on both sides in a Changing Places toilet. 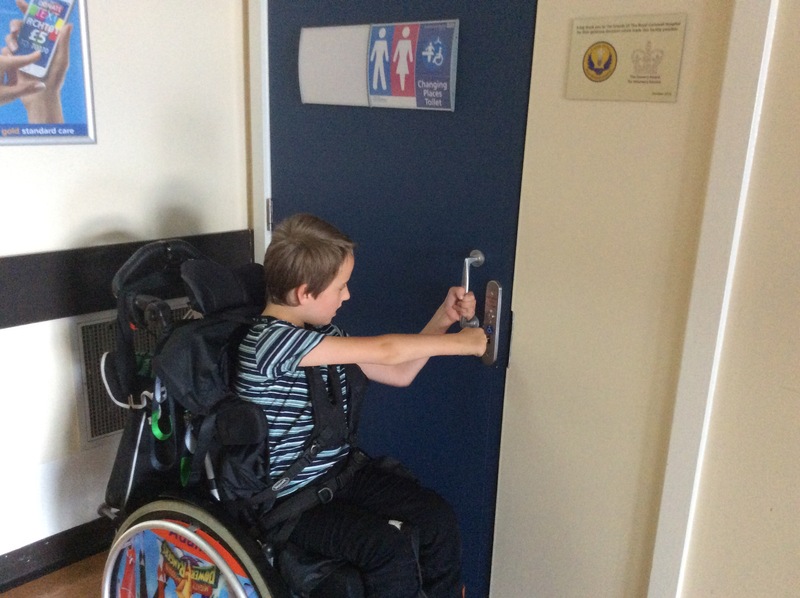 Changing Places toilets are about providing a place to change but they are also vital for enabling independence. A ceiling hoist puts Adam in control. He is part of it, not just a dependent person being manhandled. Doesn’t everyone deserve to have every bit of independence possible? Adam can help by unlocking the door. A Changing Places toilet has a logo which tells us what to expect inside. There is plenty of space for his wheelchair and he can move about freely. He doesn’t need a carer to carefully position his chair. Adam can be the user of the hoist, instead of being hoisted, or even worse, being manhandled by carers. It is easy to wash hands in a Changing Places toilet. There is room to move a wheelchair around with comfort and ease. Getting to the hand dryer is a bit of a stretch but it is possible. And we leave feeling happy and a little bit cheeky! Changing Places toilet facilities make it possible to use the toilet! The Changing Places toilet facility pictured here is in the Trelawney Wing at Royal Cornwall Hospital Treliske. Adam was visiting his Grandad on a hot day but was able to relax and have a drink during the journey, just as he should be able to. It has recently been brought to my attention that very few people know about this facility, both among staff and users. That is such a shame. Everyone should know where they are. So if you use one of these great facilities, do let other people know about them too. Help us end degrading toilet facilities. Previous: Previous post: OOPS! I took out your toilet!